18 5/16" x 15 3/8" oil on canvas 1663-64 Rijksmuseum, Amsterdam. 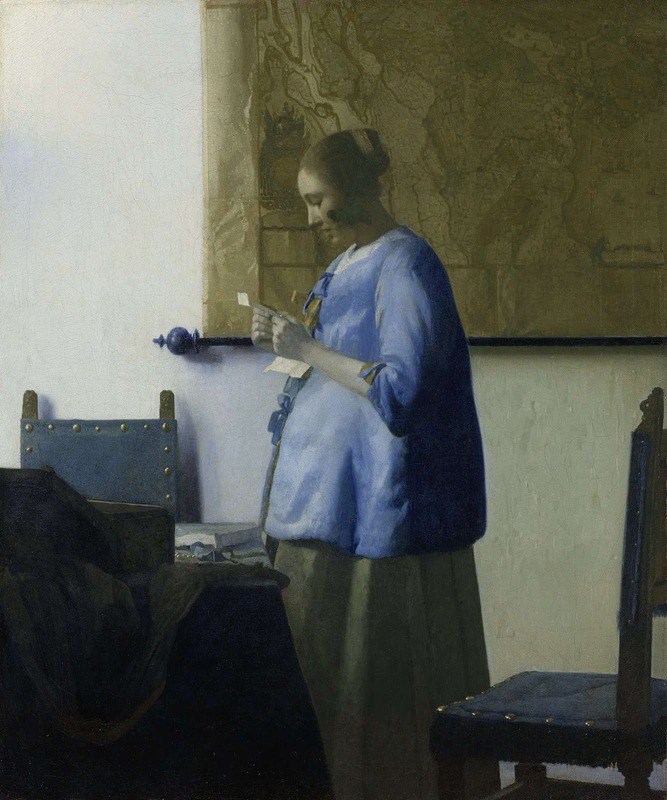 "It seems appropriate that a gesture so paradigmatic of Vermeer's art, should appear concerned with the weighing and balancing of light itself." Currently on view at the Getty Museum in Los Angeles, is Vermeer's haunting painting Woman In Blue Reading A Letter. On loan from the Rijksmuseum in Amsterdam, the Getty is the artwork's last stop on a world tour before returning to the Netherlands for the reopening of the Rijksmuseum on April 13, 2013. 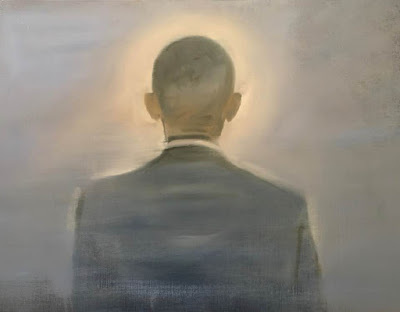 The painting is on view at the Getty through Sunday, March 31, 2013. 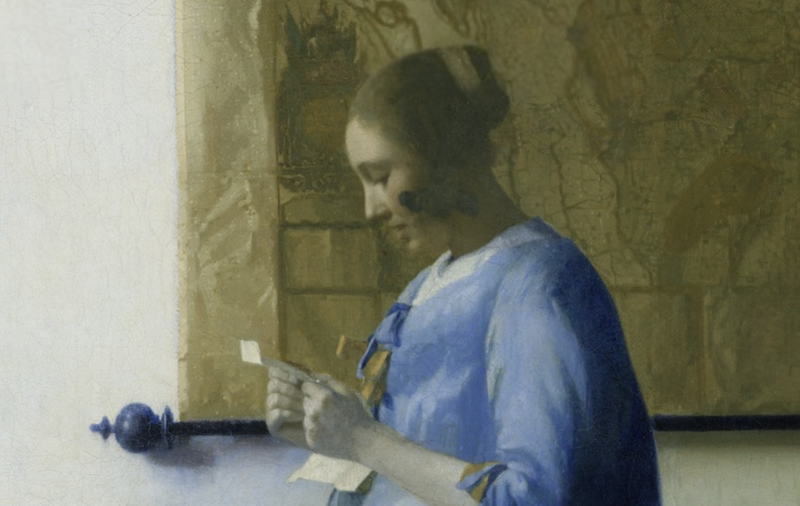 The Getty has thoughtfully installed Woman in Blue Reading a Letter amidst paintings by Vermeer's Dutch contemporaries. On a recent visit to see the work at the Getty with my friend, art conservator René Boitelle, we both were struck by how modern Vermeer's painting looks in a room full of other 17th century paintings. Both the cinematic quality of Vermeer's art and the painting's rich harmonies in blue seem to carry the work forward into our time. Also, the mystery of the image gives space for the viewer to enter into the scene and to create a sort of pictorial meaning out of the clues presented. It is morning. A woman fresh from bed, she still wears her nightcoat, stands before a window quietly reading a letter. It is a cool, wintery Northern light. The light from the window provides only a hint of warmth in a scene limned by blues. The woman's flesh is grayed with transparent glazes of lapis lazuli, as is the wall behind her. Reds seem to have been banished from the composition. Did Vermeer plan to add layers of color to this scene or did he intend to leave an image in blues? On the wall in this blue room is a map quite similar to one printed by the Dutch artist and mapmaker Claes Jansz. 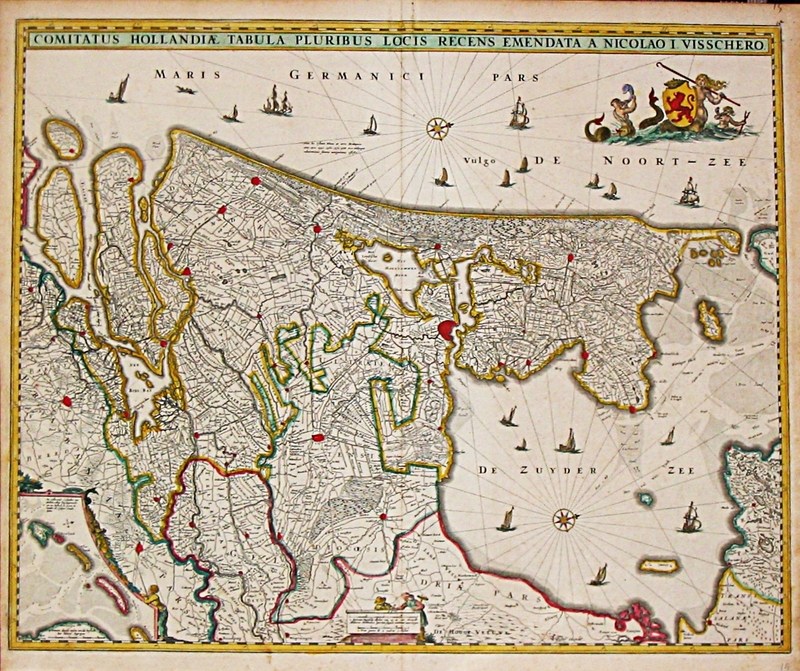 Visscher in 1652. 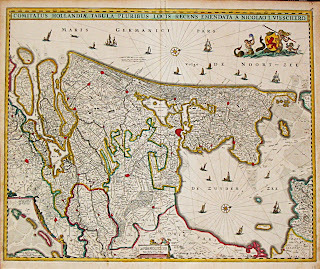 The map depicts Holland in the 17th century and brings to mind thoughts of seafaring and trade - major Dutch commercial activities then and now. Just as twitter, text messaging, and e-mail now dominate written communication, in the 17th century the personal letter became the preferred means of transmitting thoughts and ideas to close acquaintances, friends, family, and lovers. Of course official and legal correspondence had long been in use, but the discussion of private thoughts, feelings, and desires in epistolary form came into fashion during the 1600's along with a rise in middle class wealth and literacy in the Netherlands. I can't help but wonder who the letter is from. Is the map a clue? Is the letter from an absent husband? Lover? Did she receive it recently? Or did she pull it like a treasure from the open box on the abstracted table in the foreground? She reads with rapt attention. Perhaps this is her morning ritual - to each day reread the words her love left for her to cherish until his homecoming. Vermeer, amazingly allows us to witness her private moment of strength and serenity. 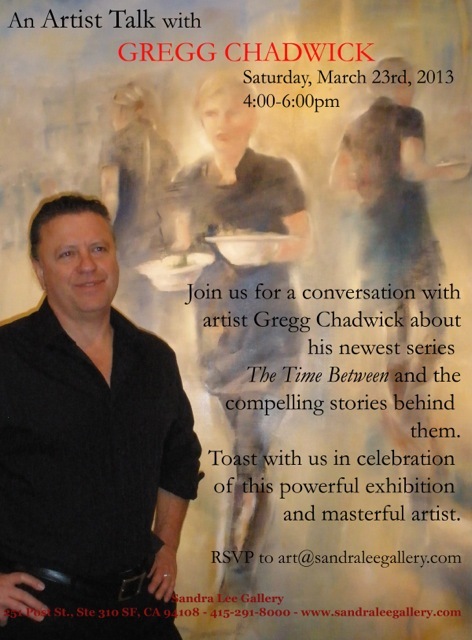 The Sandra Lee Gallery is pleased to invite you to an artist talk by Gregg Chadwick on Saturday, March 23rd, 2013 from 4 to 6 pm at the gallery. Chadwick will discuss the inspiration behind and the themes explored in his compelling artworks. Please RSVP to art@sandraleegallery.com to reserve your spot. The event is Free and open to all interested in the arts. Explore open studios, watch artful demonstrations, enjoy live music, food trucks and family friendly activities. Painting, sculpture, ceramics, and mixed media will be represented and many artists will be selling work from their studios and offering refreshments. More than 60 local artists and performers will have their private studios and works on view. The airport has developed over time into an arts incubator, and is home to a number of creative venues housed in converted airplane hangars. with Carol Wells, founder of the Center for the Study of Political Graphics, the largest repository of post–World War II historical posters in the nation. Currently on exhibit in my solo show, The Time Between, at the Sandra Lee Gallery in San Francisco, California.